The Bauer Core Wheel Hockey Bag is made out of a very strong 500D polyester fabric and is backed with a heavy-duty PVC fabric for added durability. This bag also features an internal locking telescopic handle and inline wheels making it easy getting to and from the rink. 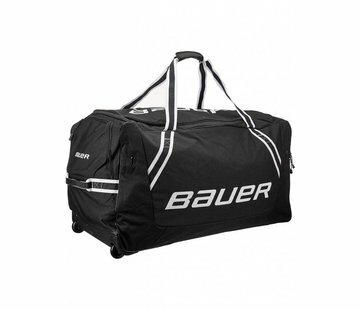 The Bauer Core wheel hockey bag offers a large compartment with heavy-duty double zippers and one internal accessory pocket good for tape, hardware, stones, and tools. The large " U " shaped top opening allows easy access to the inside of the bag. Two metal ventilation grommets on each side of the bag allow air to pass through. Two sturdy plastic rails provides stability at the bottom of the bag while raising it off of the ground away from the elements. Bauer also added rubber bumpers at the bottom 4 corners for added durability on those high friction zones.